For nearly 90 years, millions of people have gathered to participate in Holland’s Tulip Time Festival. Drawing more than 500,000 people annually, Tulip Time offers a nine-day experience of our town and its traditions. With over 5 million tulips blooming throughout the city and hundreds of klompen dancers, Tulip Time has been heralded as the nation’s Best Flower Festival, America’s Best Small Town Festival and even the 2017 – 2018 Tulip Festival of the Year! From Dutch traditional garb and dance to nationally renowned entertainment, Tulip Time celebrates both culture and community. This year, participate in all the festival offers — parades, carnival rides, wooden shoes, elephant ears, fireworks and tulips. We invite you to join as we embrace heritage and our town’s unique dance. Welkom to Tulip Time in Holland, Michigan. Need help navigating the area? 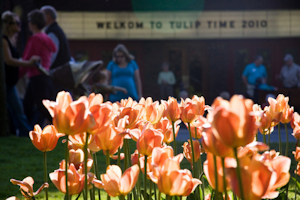 Look here to to help guide you through the Tulip Time experience. Also find info for train transportation, moving around locally and links to the nearest airports in West Michigan. Browse through the 2019 Festival Preview! What's going on today at Tulip Time? Find a concise list of events by day to quickly see what's going on & when! Looking for a place to stay just got easier. The Holland Visitors Bureau is happy to help with finding the perfect accommodations for your needs as well. With so many great options during the festival, you may become a tad overwhelmed. Never fear, we're here to give you some recommendations and options for getting to experience all of the great food options Holland has to offer. The area is full of great places to experience culture, arts and much more. Unique area attractions, points of interest & free performances during Tulip Time in the Holland, Michigan area. We fully embrace the idea of a usable community. Our city and downtown areas are walkable and usable for people of all abilities. Our transportation systems also meet the needs of people of all abilities. Come & enjoy Holland! Find all the details and a digital copy of the Group Tour Planning Guide.